You can now choose a border style from the dropdown list. Adjust the thickness accordingly by using the arrows or by manually adding a pixel value. If you wish, you can change the color of your border using the color wheel. 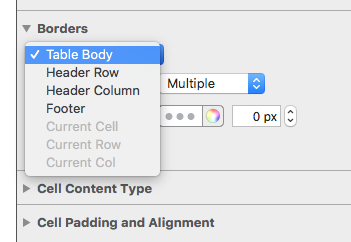 If you want to add a border to just one cell, click on this cell and make sure “Current Cell” is selected. Now you can adjust the border like in the previous step.